Minoriko Aki (秋 穣子, Aki Minoriko) is the goddess of abundant harvest in Gensokyo. Along with Shizuha, her older sister, they control the autumn season. She visits the Human Village to give humans a good harvest, and she also runs a sweet potato stand. Her first appearance was in Mountain of Faith as a stage 1 boss. Minoriko is one of the myriad gods. She appears during the autumn season in various places in Gensokyo to bless or curse the humans' crops. Minoriko is simplistic and cheerful. For a goddess, she isn't very dignified, however. She also has a superiority complex with regards to Shizuha, and together they become depressed when winter comes. In her dialogue with Reimu she said that gods put lots of time into themselves. That is why she wears freshly-harvested sweet potato smelling perfume. Minoriko is a harvest goddess. However, it appears that she's lesser-known, as there are many other, more famous harvest gods. Because of this, she's considered a "wild" or "feral" goddess who has great difficulty acquiring any faith at all. It is for this reason that she is nearly indistinguishable from a regular youkai. Compared to her sister, Shizuha, she is having more difficult time, since harvest gods and goddesses are particularly plentiful. However, she appreciates the smaller workload, and despite not having many shrines dedicated to her, she still gets enough faith from individual people. She regularly attends the humans' yearly harvest festival to bless their crops. Her ability is to control the autumn harvest. Thus, she can either bring about a plentiful harvest or destroy crops altogether. Apparently she works hard to cultivate the crops one at a time, and this power is limited to just plants that bear in the autumn. She's called to the Human Village as a special guest at the harvest festival every year. If she is not called for before the harvest, she is not able to guarantee an abundant harvest, but that's not her problem, and she would not point it out. 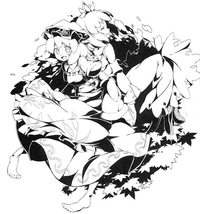 From the view of the residents of Gensokyo, the ability to make crops have an abundant harvest is a god-like power, and at looking at how she is called to the harvest festival every year, it can be considered that among gods, she considerably close and intimate to humans. Minoriko Aki (秋 穣子) is her name. The character for Aki (秋) means "Autumn" or "Fall. Minoriko (穣子) can be split into minori (穣) what could mean "Bountiful", "Harvest" or "Seed-spreading" and ko (子) what could mean "child". "Minori" could also possibly refer to 実り which means "ripening" or "harvest." In her official profile of Mountain of Faith, her name in Japanese was misspelled as Aki Minoruko (秋 稔子). Minoriko's Mountain of Faith portrait shows her having red eyes and blond hair. She wears a yellow blouse with poofy sleeves and a red dress which goes about halfway up her chest and has black straps over the shoulders. Over the dress there is a red apron which has a wheat pattern at the bottom, and her red hat has a cluster of blue grapes on the front. She doesn't have any footwear. 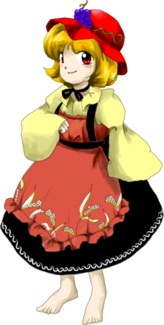 It's supposed that ZUN likened her to a Japanese one-legged scarecrow which guards farms, due to her having two left feet. The Japanese term for "scarecrow" (かかし, kakashi), came from kagashi, which means "smeller". This may explain why Minoriko talks about her smell in Reimu's scenario. 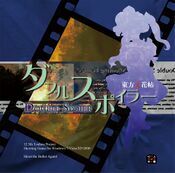 Minoriko fights Reimu or Marisa in Mountain of Faith near the Youkai Mountain. Minoriko is afraid to be eaten by Reimu in their dialogue, as Reimu smells something tasty. Minoriko says the smell comes from her perfume made of freshly-harvested sweet potatoes. She is still afraid of getting eaten by Reimu when the fight starts, and gets defeated. Marisa says she could use some practice, and then Minoriko shows up. Minoriko says that the youkai in the Youkai Mountain are much different from those Marisa has already met and that she should be afraid of them, but Marisa isn't. Then Minoriko starts to fight, but is easily defeated by Marisa. In Double Spoiler, Minoriko was Aya's practice partner, but she got annoyed and started to attack Aya. She appeared as a stage 1 target, where she uses a few spell cards and had Aya Shameimaru and Hatate Himekaidou take photos of her and her danmaku. Minoriko made a background cameo appearance in Hopeless Masquerade on the Genbu Ravine and Youkai Tanuki Forest stage. She is seen with her sister Shizuha Aki cheering. Shizuha is her older sister. Together they control the season of fall. She helped Aya for practicing photo shooting in Double Spoiler. Eventually she got annoyed and attacked. Every year she is called by the villagers for the harvest festival. She guarantees them an abundant harvest. Minoriko's Sigil in the Grimoire of Marisa. The Demo CD of Mountain of Faith. It makes very much sense for Minoriko to be the younger sister who is the goddess of the harvest as the harvest comes after the changing of the leaves in the season. 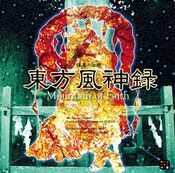 Minoriko appeared on the cover of the demo CD of Mountain of Faith. Minoriko got a small reference in Sanae's part of the Ten Desires prologue. The first stage boss, and Shizuha's younger sister. Normally, they rule over autumn as sisters. She's called to the village as a special guest at the harvest festival every year. If she is not called for before the harvest, she is not able to guarantee an abundant harvest, but that's not her problem, and she would not point it out. ↑ Ten Desires: Prologue — "For example, prayers for a great harvest, or protection from misfortune..."
This page was last edited on 25 August 2017, at 05:55.